As New York moves towards 50% clean energy by 2030, energy storage will play an integral role in modernizing the state’s electric grid. Key Capture Energy (KCE) and NEC Energy Solutions (NEC) today jointly announced that they are teaming up to work together on KCE NY 1, a 20 megawatt (MW) battery storage project in Saratoga County, New York. 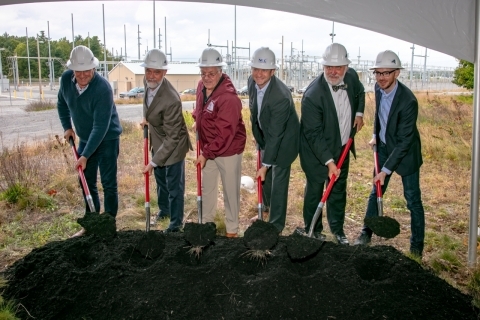 KCE NY 1 is a key part of the next generation of the New York electric grid and will enhance the power grid’s performance and reliability with reduced carbon emissions, while promoting economic and job growth in upstate New York. NEC will provide KCE with a best-in-class technology solution for the Saratoga County project, as well as turnkey engineering, procurement and construction (EPC) services from a New York firm. Yesterday, executives from KCE and NEC joined to break ground on the KCE NY 1 project, commencing construction. Other people in attendance at the groundbreaking ceremony include: Marilyn Smith - Economic Development Liaison at the Office of Congressman Paul D. Tonko, Ed Kinowski - Stillwater Town Supervisor, Tony Abate - Energy Storage & Demand-side Resources at NYSERDA, Bill Acker – Executive Director of NY-BEST, Zack Dufresne - Director, Communications & Membership at ACENY, Marty Vanags – President of the Saratoga County Prosperity Partnership, Kevin Hedley - Chairman of the Board of the Saratoga County Prosperity Partnership, Mike Relyea - President of the Luther Forest Technology Campus, John Fusco – Board Member of the Mechanicville-Stillwater IDA, and many others. KCE’s NY 1 project is the largest lithium-ion battery storage project in New York State and supports Governor Cuomo’s commitment for New York State to reach 1,500 MW of energy storage by 2025. In Governor Cuomo’s 2018 State of State Address, it was recognized that in addition to providing roughly $2 billion in gross benefits and avoiding more than one million metric tons of CO2 emissions, by 2030 New York’s energy storage industry could employ approximately 30,000. It also supports New York State’s Energy Storage Roadmap, which was released in June and developed by the Department of Public Service (DPS) and New York State Energy Research and Development Authority (NYSERDA) with input from numerous stakeholders such as Key Capture Energy. The Roadmap identifies near-term recommendations for how energy storage can deliver value to New York electricity consumers and cost-effectively address the needs and demands of the grid. Additionally, energy storage can help achieve the aggressive Clean Energy Standard goal of getting 50% of New York’s electricity from renewable sources by 2030, while at the same time ensuring that carbon is reduced by 40% compared to 1990 levels. This announcement marks an important example of the ever evolving energy landscape in New York State. KCE has been developing energy storage projects in the Northeast for several years and has a portfolio of projects in various stages of development. For this inaugural installation, KCE launched a competitive RFP process in February 2018 and received tremendous response from interested and qualified participants. NEC will provide KCE with its GSS® end-to-end grid storage solution and its AEROS® proprietary energy storage controls software; the system includes a flexible design to accommodate wholesale market opportunities in the NY ISO market. Key Capture Energy is an independent developer of utility-scale battery storage projects and identifies, prospects, develops and deploys energy storage applications that address frequency regulation, voltage/reactive power support, black start, capacity, energy arbitrage, transmission deferral and non-wires alternatives. Key Capture Energy is a team of experienced clean energy experts who have grown some of the world's largest renewable energy companies. With a focus on meeting the needs of the electric grid, and working closely with all local stakeholders, Key Capture Energy is focused on developing projects throughout the eastern United States. NEC Energy Solutions designs, manufactures, and integrates smart energy storage solutions for the electric grid and applications with critical power needs. Its megawatt-scale energy storage and control systems provide greater stability to the grid while maximizing renewable generation, while in telecom, datacenter, and other industrial applications, its high performance lithium-ion battery systems provide better value than traditional lead-acid batteries in tough, critical power applications.